It’s extremely easy to make and takes about 30 minutes from start to finish. Perfect for summer dinner parties, and it looks great. I was cooking for five adults and three children, so it’s not a cheap recipe – all up I spent NZ$50 on lamb racks. That’s an obscene amount of money given that New Zealand is the worlds number 1 lamb producing nation. There was none left over. Score the lamb fat in a criss-cross pattern and season with salt and pepper. Seal the racks in a hot cast iron pan with a little olive oil, until golden brown (about four minutes each side). Transfer the racks to an ovenproof dish or roasting tray and pop into the oven for 10-15 minutes. It’s ready when the meat feels firm but springy. Take the meat out of the oven to rest. While the meat is resting (or you can do this well in advance) make the herb crust. Tear the bread into pieces and put into a food processor. Roughly chop the herbs and add to the bread with the grated parmesan. Whizz to make fine crumbs. 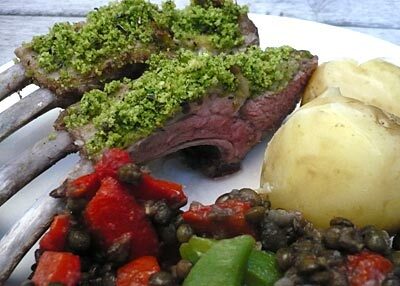 Brush the scored side of the lamb with mustard then press the herb crust mixture onto the lamb. You need a firm thick coating. Return the meat to the oven and warm through for another 5 minutes. I turned the oven up to 250ºC for this final ‘warming’. 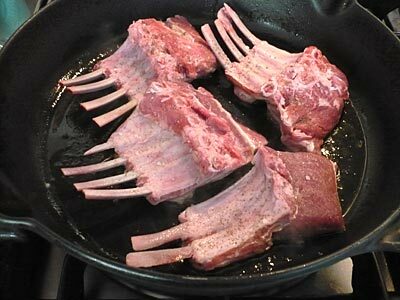 Slice the lamb into individual chops, or as many as you think looks attractive. I did pairs which looked more substantial, especially since the lamb racks were quite small. Serve with new potatoes and an salad you think appropriate. This looks like a meal only served in restaurants. You’ll be the star of the dinner party! how to choose a good lamb? Fab recipe. My first go at lamb cutlets and a brilliant result. Glad you enjoyed it. This is one of those recipes that looks difficult but is, in the end, surprisingly simple. I bet everyone was impressed with your efforts. I just bought a new BBQ and cooked the ‘Black and Blushing‘ recipe tonight. It’s my current favourite!